Many people suffer not just from lack of sleep, but also quality. It is important for the body to go into REM sleep, which is a deep restorative, healing sleep. We need at least 6 uninterrupted hours of sleep for organ healing. When we sleep, our body heals, detoxifies, and restores. It is important to get into bed at a good time, so as to not cheat our bodies out of that healing. It is detrimental to go to bed really late, try to sleep the necessary amount, then wake later in the morning hours. Some people need more sleep than others, but ideally, we should be getting at least 7 hours of sleep. 8 hours is even better. When you go to bed, unplug as many electronics as possible. Do not charge anything in your bedroom. If you must use your phone as an alarm, place it at least 8 feet away from your bed. It charges your brain, and also sends out harmful electromagnetic frequencies. An LED alarm clock is a much better choice, but it is best to plug it in across the room. The light can also trick the body into thinking it is daytime, and disrupt the body’s circadian rhythm. Make your room as dark as possible. Caffeine can stimulate the body long after that cup of tea or coffee. Limit your caffeine intake to one mug a day, not past the morning. Keep your bedroom as cool as possible, with loose-fitting cotton sleepwear during sleep. Going to bed with a lot on your mind makes it almost impossible to turn off. It helps to write things down. Then, unwind through reading. A late snack is never a good idea. Close the kitchen by 7 pm. When we go to bed, we should not be digesting. This alone can keep you awake. Lastly, try to leave 2 hours after exercise before bed to allow the body to wind down and get tired. Allow time for the body to wind down before bedtime. 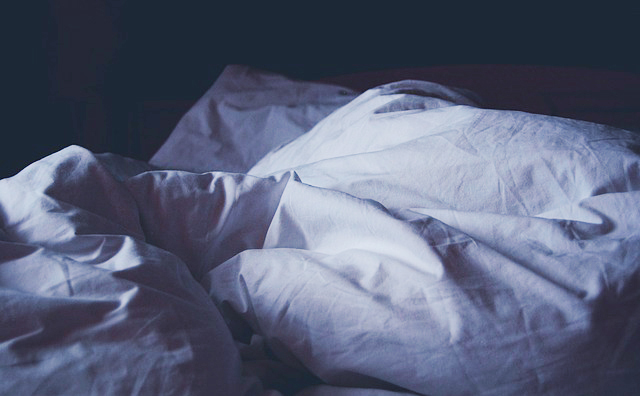 Our bodies like routine, especially at bedtime. Think about how well a child does with their bath and bedtime story. Wash your face, prepare your bed, and read or settle down before bed. Whatever your routine is, allow for this time. It is much more difficult for the body to wind down from late activity or missing routine steps. A warm Epsom salt bath and chamomile tea are a great way to wind down. Essential oils can help the body relax and feel more tired. Try adding a few drops of lavender in a glass or metal spray bottle and spray your pillow before sleep.